Stylish and contemporary, these 5-star luxury apartments have a magnificent location on Scarborough's North Bay, on Yorkshire's rugged and beautiful East Coast. The Sands are Scarborough's premiere holiday accommodation apartments and have been given a 5-star rating by VisitBritain. The luxurious apartments offer all the freedom, independence and convenience of apartments with the personal service of a hotel. Every apartment is stylishly appointed and beautifully equipped. 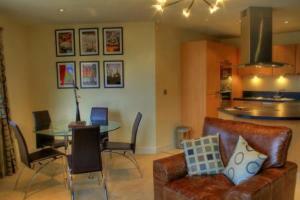 All apartments have modern 5-star furnishings, flat-screen TVs, DVD players and designer kitchens and bathrooms. The bathrooms come complete with luxurious toiletries and bathroom products from Elemis. Each apartment has a grand balcony, where you can look out to Scarborough Castle and admire the stunning sea views. Every apartment is allocated a free parking space in the secure car park. There is a state-of-the-art gym for the exclusive use of guests, as well as a rooftop sun terrace with breathtaking views.